Sophocles (495 - 406 BC), the most prolific of the Greek playwrights whose works survive, wrote a number of plays about the family of Oedipus, legendary king of Thebes. Of these plays, the two most popular are Oedipus the King and Antigone. The former tells the tragic story of Oedipus' search for the murderer of Laius, the previous king. His investigation inexorably uncovers Oedipus' true identity, the discovery of which is so horrific that Oedipus blinds himself and goes off into exile. 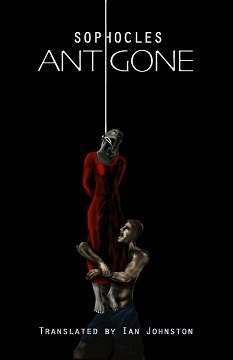 The story of Antigone begins soon after Oedipus' downfall and the ensuing quarrel between his two sons over who should rule Thebes, a conflict which leads to a battle in which the two sons kill each other. The new ruler, Creon, decrees that Polyneices, the son who brought a foreign army against Thebes, will not be allowed a proper burial. Antigone, Oedipus' daughter, believes the proclamation is contrary to the rule of the gods and so takes it upon herself to bury her brother. When Creon discovers what she has done, he orders her death. By the time he is dissuaded of this action by a prophecy of doom should it be carried out, Antigone has already accepted her fate and taken her own life. Her lover, Haemon, who is Creon's son, finds her and in his grief over her loss, takes his own life. Thus the prophecy is carried out despite Creon's last minute attempts to change fate's decree.